Voting Rights Remain Under Attack 50 Years After the Bloody Sunday March in Selma | Democracy Now! president and director-counsel of the NAACP Legal Defense Fund. Tens of thousands of people, including President Obama and more than 100 members of Congress, traveled to Selma, Alabama, this weekend for the 50th anniversary of Bloody Sunday. On March 7, 1965, hundreds of peaceful voting rights activists were brutally attacked by Alabama state troopers, crossing the Edmund Pettus Bridge as they attempted to march from Selma to Montgomery. Bloody Sunday was the first of three attempted marches, finally completed under federal protection and led by Dr. Martin Luther King Jr. on March 24. The protests helped bring about the 1965 Voting Rights Act. “That’s the irony of being here today,” says Sherrilyn Ifill, president and director-counsel of the NAACP Legal Defense Fund. “We’ve come to commemorate and lift up and celebrate the activism and the passage of the 1965 Civil Rights Act. But today the Voting Rights Act is under peril because of the Supreme Court’s decision in the Shelby case two years ago.” Ifill outlines how the court ended federal review of changes to voting laws in jurisdictions with a history of abuse, thereby launching a wave of new voting restrictions. She also details efforts by the NAACP-LDF to restore this protection. SHERRILYN IFILL: My name’s Sherrilyn Ifill. I’m the president and director-counsel of the NAACP Legal Defense Fund. 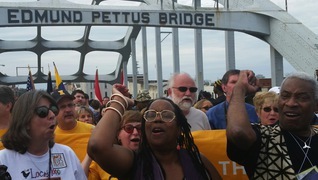 We come to Selma, actually, every year for the anniversary, so we’re actually happy to see so many more people here this year for the 50th. It’s special for us because, you know, LDF lawyers represented the marchers in all of the battles in the federal courts. As a matter of fact, we put up on our website today at www.naacpldf.org the original march plan that the lawyers created and submitted to the court, to Judge Frank Johnson, that was approved, right down to the number of toilets and how long the marchers would march. All of that had to be approved by the federal court for that final march. As you know, it’s actually three marches: It’s the first march, the Bloody Sunday march; it’s the second march in which Dr. King led people to the bridge, then knelt in prayer and turned back; and then, finally, the third march, in which they went from Selma to Montgomery. And so the march began, and they walked from Selma to Montgomery, and Martin Luther King gave a triumphant speech at the end of the march. It was really important for the collaborative of people in the movement. It was SNCC, and it was activists on the ground in Selma, and it was faith leaders, and it was Martin Luther King, and it was so many people who came together as a result of that activism. It almost was a microcosm of what was at stake and the way in which Southern officials responded to the determination of African Americans to be real citizens.